CHICAGO -- More than two decades ago, Toyota bucked another SUV craze by stripping away heavy-duty features that made the vehicles harder to drive on pavement. Instead, the Japanese brand concentrated on the shape and the added safety of a heightened seating position when it launched the RAV4 crossover. Now, with the redesigned fifth-generation RAV4, Toyota will finally offer its top-selling crossover in a model made to match the off-road prowess of those SUVs from long ago. The 2020 RAV4 TRD Off-Road, introduced Thursday at the Chicago Auto Show, will arrive this fall outfitted for the first time more for the trail than the cul-de-sac. With 8.6 inches of ground clearance and a 2.5-liter inline-four engine combined with an eight-speed automatic transmission, the RAV4 TRD Off-Road is rated to tow up to 3,500 pounds. Its dynamic torque vectoring all-wheel-drive system comes standard, and can direct up to 50 percent of the powertrain's torque to the rear axle, and split that torque to each wheel depending on need. When the added traction isn't needed, the rear driveline disconnects to boost fuel efficiency. The RAV4 TRD Off-Road shares a number of features with the crossover's Adventure trim, but with added touches to improve capabilities on the trail, including an improved heavier-duty suspension system and lighter rims to lower unsprung weight. It will ride on Falken Wildpeak A/T Trail all-terrain tires. 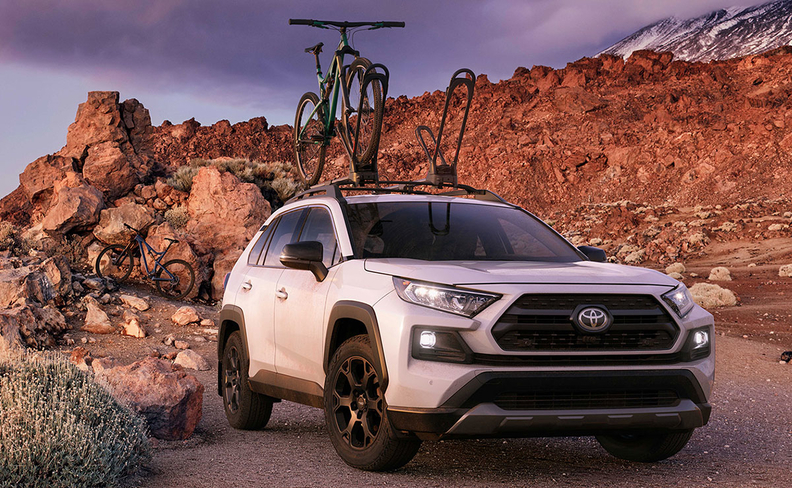 In terms of styling, the RAV4 TRD Off-Road will feature an aggressive look with high-rise roof rails, large overfenders and a bumper grille and fog light surrounds similar to the Adventure trim, but accented by dark gray front and rear lower fascias. The crossover's cabin is accented in red trim and stitching and features the TRD logo stitched into the headrests, along with TRD floor and cargo mats. Pricing for the RAV4 TRD Off-Road trim was not announced.